Margaret Floy Washburn graduated from Vassar College in 1891 and joined the ranks of Mu Chapter, Phi Beta Kappa in 1898. She audited classes in Psychology at Columbia, but, unable to matriculate because she was a woman, transferred to Cornell into a credited program for the M.A. degree. Her Master’s degree was sent by E.B. Titchener, her graduate mentor, to be published and she was Titchener’s first graduate student to receive a Ph.D. She was also the first woman in the U.S. to receive a Ph.D. in Psychology. 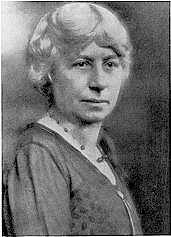 Taking a position first at Wells College, she successively took several underpaid positions at colleges and universities, including Cornell and the U. of Cincinnati, returning to Vassar as an Associate Professor of Philosophy in 1903. In that year she was also included on Cottrell’s list of one thousand most important “American Men of Science,” as one of three women to be included. At Vassar, she was the first woman in the country to establish a psychology laboratory. There she mentored sixty-nine published studies with 177 students. Her active life as a seminal psychologist continued to influence many of her students who turned to the field of Psychology. She taught at Vassar until 1937 and died in 1939. Along with a handful of colleagues, she led the way among women faculty members with distinction. Her concern was first and foremost for her students. She organized “fundamental principles of a motor system of psychology,” and her book The Animal Mind, A Textbook of Comparative Psychology went to a second printing and was translated into Japanese. In 1937 she started a faculty outcry on the Vassar campus opposing the demolition of Vassar Brothers Laboratory, where she had established her early Psychology Lab. President MacCracken had decreed that the building was unfit. Washburn opposed the move because it would cause the department to be housed in Blodgett Hall of Euthenics, which had then just recently been built. As usual, her opposition was on principle, as she thought the discipline of euthenics would return women to the kitchen, from which they had been emancipated by Matthew Vassar. She was honored with an award by the New York State Psychological Association in May, 1994.